When the NBA Finals tip off on Thursday night every person who has ever shot a jump shot in their life will argue their talking points about Lebron, Kyrie, Steph and K.D. There is no arguing however about who the most majestic member of the Golden State Warriors is; that title belongs solely to Alvin “Al” Attles. Al Attles was one of the first African-American coaches in the NBA, when he became a player-coach for the Warriors at the midpoint of the 1969-70 season. If Lebron is the closest thing you’ve seen to a player/coach, the league actually verified them as such in days long gone by. Attles was drafted in the fifth round by the Philadelphia Warriors after graduating from North Carolina A&T in 1960. He found out he was drafted when he bumped into a fellow student in the cafeteria who heard it on the radio. During his time at A&T he played for legendary head coach Cal Irvin, leading the Aggies to consecutive CIAA titles in 1958 and ’59. Attles wasn’t very excited about his opportunity to make it in the NBA. He initially declined the Warriors’ invitation to training camp and took a job as a junior-high gym coach in his hometown. After nearly getting drafted by the Army, he flunked his physical because of a bad back, Attles decided the NBA might be worth a shot after all. Attles played in one of the most famous games in NBA history, playing second fiddle to teammate Wilt Chamberlain’s 100 points, managing to get 17 points on 8 for 8 shooting that night. Attles averaged just 8.9 points during his 11-year playing career, but this Aggie earned the nickname “The Destroyer” for how aggressive he was on the court. Once he began coaching full time Attles guided the Rick Barry-led Warriors to the 1975 NBA championship over the heavily favored Washington Bullets. The championship made him the second African American coach to win an NBA title behind Bill Russell. Attles coached the Warriors for a total of 14 seasons, with a 588-548 overall record; making him the longest tenured coach in the history of the organization. Attles didn’t decide to take it easy after that, he worked as the Warriors’ general manager during the 83-84 season and has worked for the ball club in various capacities every year since then. His now 57-year streak with the Warriors is the longest uninterrupted streak of any person for one team. 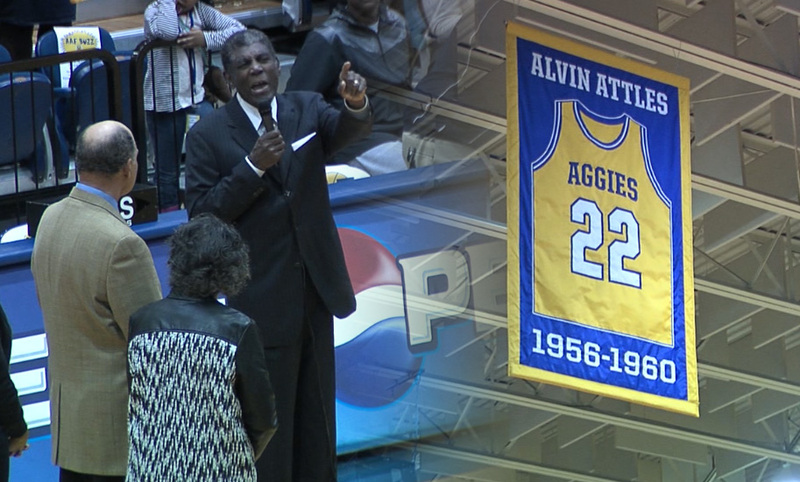 On February 7, 2015, Attles’ number 22 was retired by North Carolina A&T at a ceremony versus North Carolina Central, the first ever retired by the team. Attles was also inducted into the National Black College Alumni (NBCA) Hall of Fame in 2016. He’s one of only six players in Warriors history to have his jersey retired. When the game tips off on Thursday night, Attles will be in the arena watching two black head coaches plot, diagram and scheme against one another on the biggest stage hoops has to offer. A stage that he helped pave the way to forty seven years ago. The first couple of months of 2019 have brought several unfortunate headlines for FAMU. With the win, Jackson State completed the season sweep versus Grambling.